Atlas Obscura seems to have reached a point that it no longer can describe itself as, well, obscura. The website enjoys more than 300,000 pageviews each day and has produced a book, which is currently the “#1 Best Seller in General Travel Reference” and #293 overall at Amazon. While individual entries might be, physically, off the “beaten path,” they are smack in the center of the virtual beaten path. Given Atlas Obscura’s place in popular culture, and our current anxieties about misinformation, it would be nice if Atlas Obscura tried to ensure it provided accurate information. 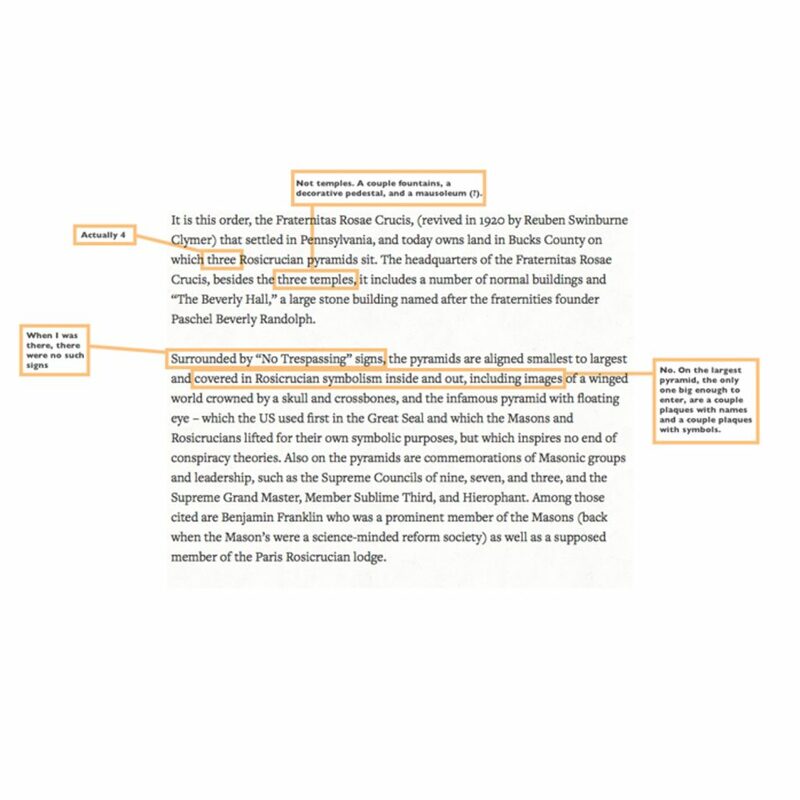 Regrettably, the one entry I happened to check, the “Rosicrucian Pyramids of Bucks County,” seems to be a hodgepodge of misunderstood and misreported information, historical errors, and factually incorrect statements. 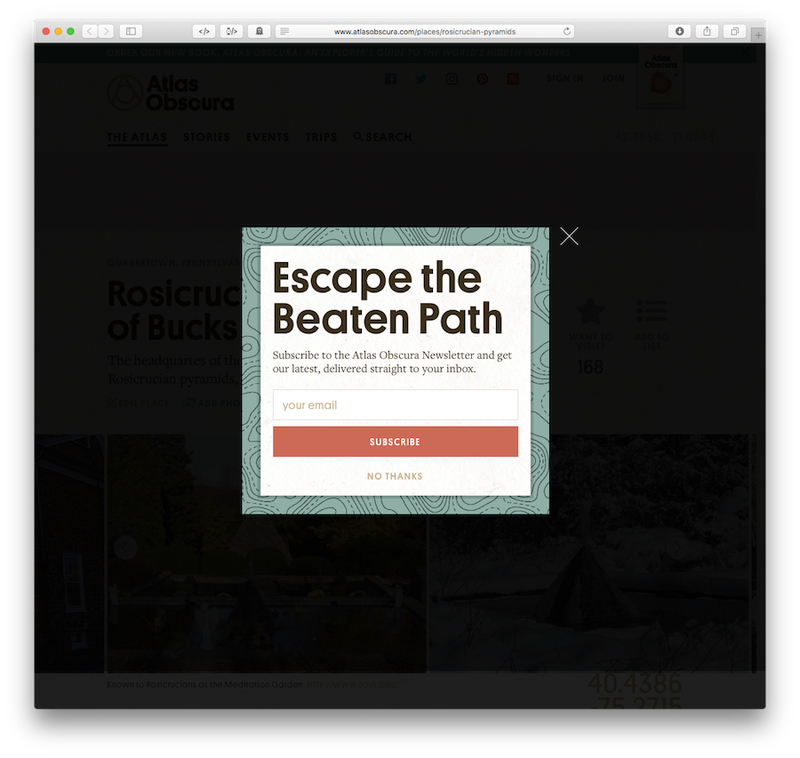 When Atlas Obscura promises to “escape the beaten path,” does that also mean the beaten path of facts? By looking at two paragraphs from the post—one that purports to provide historical information and one that purports to describe observable facts—we see an author who doesn’t try very hard to distinguish fact from fiction and a website that doesn’t care enough to factcheck its posts. Inspired by the idea of a secret society of learned men, astronomers such as Johannes Kepler, Georg Joachim Rheticus, John Dee and Tycho Brahe formed an actual society, known as the Invisible College, to acquire knowledge through experimental investigation. It would eventually become the Royal Society. The once common but erroneous identification of the Invisible College as an antecedent of the Royal Society derives from Boyle’s eighteenth-century editor Thomas Birch. There is now thought to be no link between Boyle’s ‘college’ and the philosophical society …. It is this group, with which Boyle became associated during the 1650s, that is regarded as the precursor to the Royal Society…. If the author of the Atlas Obscura post had looked at the Wikipedia entry on the Invisible College, which cites Lauren Kassell’s entry, perhaps we wouldn’t be reading this myth yet again. Some of the problems in this paragraph that described the pyramids. 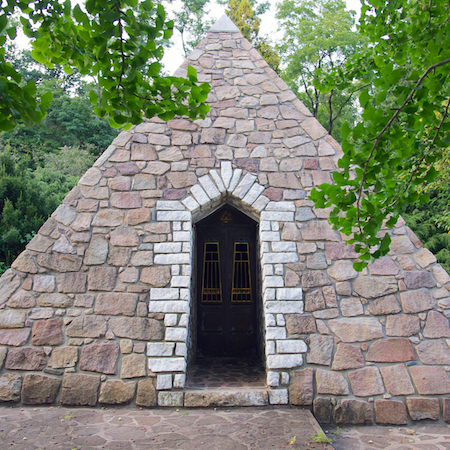 …the Fraternitas Rosae Crucis … settled in Pennsylvania, and today owns land in Bucks County on which three Rosicrucian pyramids sit. The headquarters of the Fraternitas Rosae Crucis, besides the three temples, it includes a number of normal buildings and “The Beverly Hall,” a large stone building named after the fraternities founder Paschel Beverly Randolph. Um… no. There are four pyramids, not three. Only one is large enough to enter and could be mistaken for a temple, though it seems more likely a mausoleum or similar memorial. Two resemble garden fountains that stand 4–5 feet tall (when I visited only one was functioning). The smallest pyramid seems to be a pedestal type decoration. As of a year ago, there were no “No Trespassing” signs (there weren’t any the first time I visited either). Finally, the pyramids are all but unadorned. They certainly are not “covered in Rosicrucian symbolism inside and out.” The largest, the mausoleum (? ), has some brass plaques on the outside that list names of deceased members, and you can see a few decorative plaques inside that do have some Rosicrucian symbols on them. Perhaps this entry on the Rosicrucian pyramids is aberrant. Perhaps all the other posts are accurate. Or, perhaps, Atlas Obscura should be rebranded Atlas Obscura but Not So Accurata.